Make this early as you will need to let it cool so it will not melt your popcorn. One batch of sauce makes a little over a cup. I found that it will cover 2 normal sized bags of popcorn. Mix the brown sugar, coconut milk, Earth balance and salt in a saucepan over medium-low heat. Whisk gently and let cook for 5 to 7 minutes, until it thickens. Add vanilla and cook another minute to further thicken. Turn off the heat, cool slightly and pour the sauce into a bowl or jar to cool. Let cool until its room temp and thick. Preheat your oven to 250 degrees. Once your caramel has cooled, Pop your pop corn and pour it into a bowl, I recommend doing this one bag at a time so you can successfully get all of the kernels out that aren’t popped. Place your popcorn in a bowl and tap it against the counter a few times so all of the undesirable kernels fall to the bottom. Gently transfer your popcorn to a different bowl with your hands, grabbing a little at a time. Your unpopped kernels should remain in the bottom of the first bowl to be thrown away. 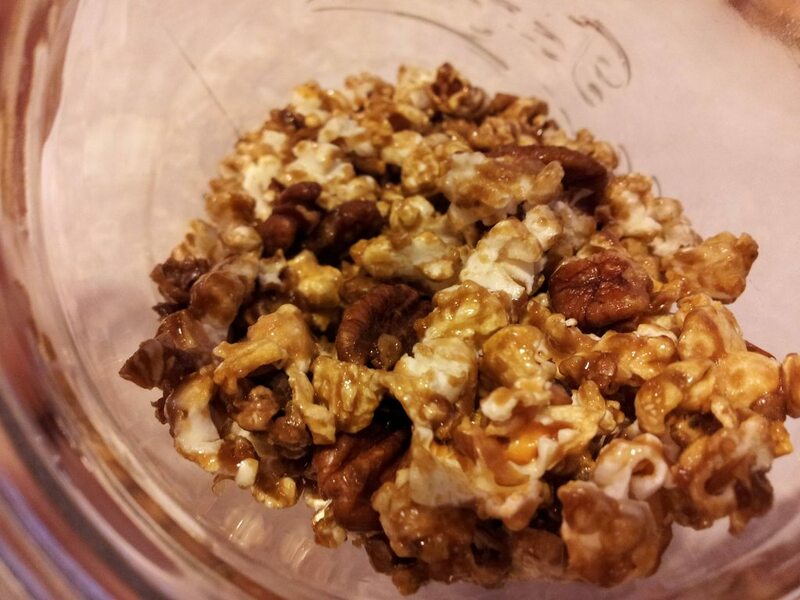 Steadily pour a stream of caramel sauce over the popcorn as you carefully toss it around, Now is the time to add any other things such as pecans or almonds, cashews, etc. Although, if you wish to add chocolate, wait until the last 15 minutes so it will not over cook. Once coated evenly, place on a non-stick or well greased cookie sheet and place in the oven. Set a timer for 15 minutes, take out of the oven and stir around and place back in the oven. Total cooking time is 1 hour, making sure to stir it every 15 minutes. 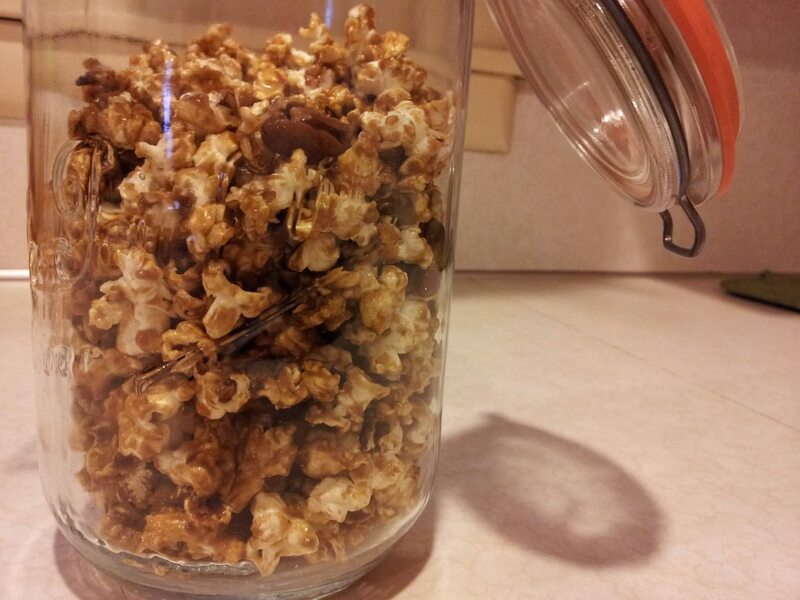 When the hour is up, spread the popcorn on a piece of wax paper to cool, then place in a desired air tight container. Bring the beer, cardamom and orange zest to a gentle boil in a saucepan over medium heat. Cook, stirring, until reduced to 1 cup, about 10 minutes. Add the Earth Balance and brown sugar. Cook, stirring only if the mixture looks like it might boil over, until thick and syrupy, about 10 to 12 minutes. To test for doneness, drop a bit of caramel into a bowl of cold water. It should form a soft ball. If not, keep cooking, but make sure not to burn. Slowly stir in the coconut milk and cook until the sauce thickens, about 5 minutes. Remove from the heat and stir in the vanilla and salt. Remove the orange zest with a spoon. Let the caramel cool slightly, then transfer to a bowl or jar. The best part about this sauce is that it will keep in the fridge for more than 1 week up to 2 weeks.